For over 20 years, Alliance Concrete has been serving the Brantford, Hamilton, Grimsby, Burlington, Oakville and surrounding markets. Our time in the concrete industry has allowed us to perfect our residential and commercial concrete services. We have had to opportunity to work with various commercial and residential clients over the last 20 years and learn how the industry works. Alliance Concrete started with humble beginnings, as a small company and now we service many areas and many clients. Our loyal customers are the success behind our growth and helped us become the company we are today. We take great pride in being able to serve our clients with the best materials and modern concrete solutions. Concrete can be where your children play in the summers, what you walk the dog on, concrete can be what's holding your basement up or the flooring beneath your feet. Here at Alliance Concrete, we have concrete designers who will bring out the life in your concrete. 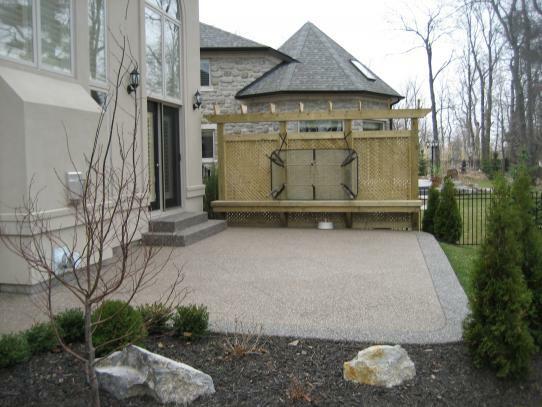 We can help you customize your concrete project for your backyard, patio, driveway, walkway and more. Alliance Concrete prides itself on consistently providing excellence and quality work in all of our concrete projects. We work hard to make sure your concrete needs are met every time. We offer various concrete services for many residential or commercial markets. From concrete curbs, driveways, walkways, to parking lot paving and asphalt repair. Alliance Concrete is your one stop shop for all your concrete needs. Our work is meticulous to ensure that your concrete is durable and has a long life. Overtime concrete can crack or become damaged, our goal is to prolong the wear and tear for as long as possible. We can do this with the correct installation and the best sealing. Visit our Testimonials and Photos page to see for yourself. Call us today and request an onsite quote! We can often get started on your project the same day.